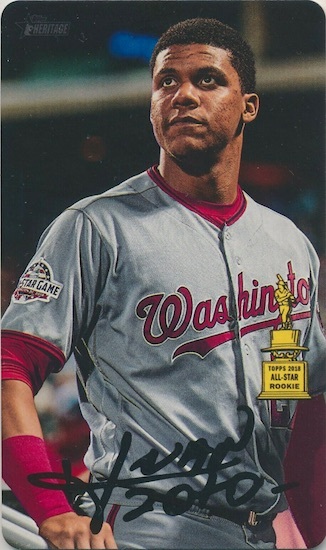 Remembering the collecting past fondly, the retro-focused 2019 Topps Heritage Baseball forges ahead with another tribute to flagship Topps. While the 2018 release set its sights on 1969, the 2019 product looks to the next year for inspiration. The standard Hobby box output of one autograph or relic remains the same. Displaying the thick frame of 1970 Topps Baseball, the base set in 2019 Topps Heritage Baseball totals 500 cards. This includes 100 high-number short prints. The familiar Black Border (50 copies) and Flip Stock (5 copies) parallels are again limited to Hobby boxes. These are joined by Chrome parallels for 100 subjects that add Refractor (#/570), Black (#/70), Gold (#/5; Hobby only) and SuperFractor (1/1) versions. Collectors should also be prepared for the exclusive Hot Box Refractor parallels in Hobby and Blaster boxes. New this year are the Silver Metal Base cards, numbered to 70 copies. And we can't forget those Base Mini cards, numbered to 100. 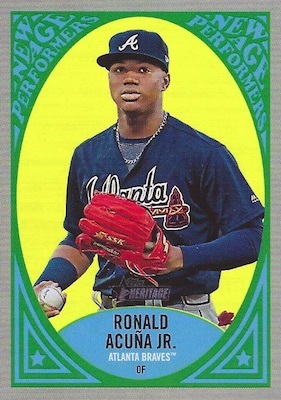 Of course, the 2019 Topps Heritage Baseball checklist has variations to spot. Hobby-only Action Image Variations and Team Name Color Variations are back, as are the elusive Throwback Uniform Variations. 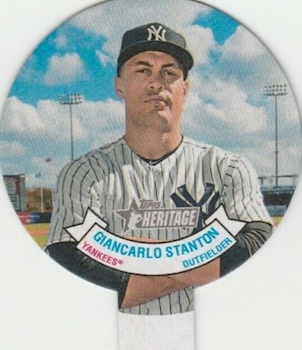 Averaging multiple inserts in every box, 2019 Topps Heritage Baseball sticks with standard themed sets like Baseball Flashbacks (1:20 packs), for the key MLB moments from the '70 season, as well as News Flashbacks (1:20 packs), for the other newsworthy events from the year. 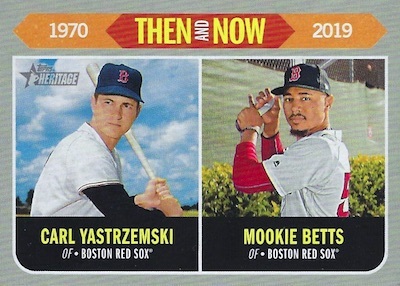 In addition, New Age Performers (1:12 packs) highlights modern stars with an old-school design, and Then and Now (1:20 packs) compares the stats of a 1970 star versus a 2019 star. 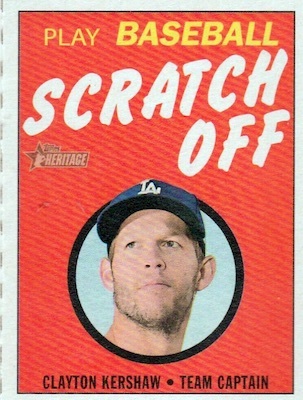 There is also the 1970 Topps Scratch-Offs (1:24 packs) insert, which is an homage to the original cards from the '70 set. 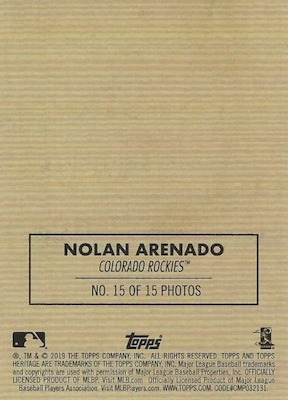 The retail-only 1970 Player Story Booklets set is kept to just 250 copies. 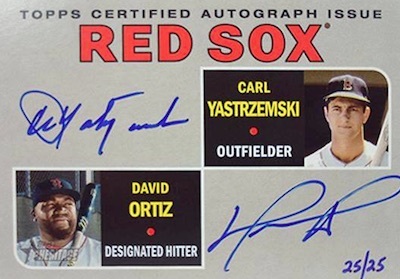 Working within the Real One Autograph line, 2019 Topps Heritage Baseball promises many on-card signatures. Although the base versions are signed in blue, the Real One Special Edition cards use red ink and are hand-numbered to 70 copies or less. 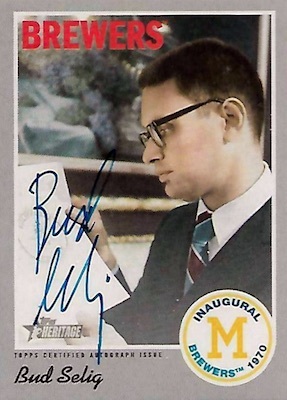 More autographed cards are issued in the Hobby-only Real One Dual Autographs and Real One Triple Autographs. 2019 Topps Heritage Baseball also remembers the Milwaukee Brewers in their inaugural season with on-card Brew Crew Autographs (100 copies) featuring several players from 1970. The hard-signed selection finishes with a few autograph memorabilia sets. This includes Clubhouse Collection Autograph Relics (#/25 or less), Clubhouse Collection Dual Autograph Relics (#/10 or less; Hobby only) and Flashbacks Autographed Relics (#/25 or less). Each has a one-of-one Patch parallel that is exclusive to Hobby boxes. As is normally the case, it appears the only autographs not done on-card are the Cut Signatures (1/1) for various baseball and celebrity subjects. 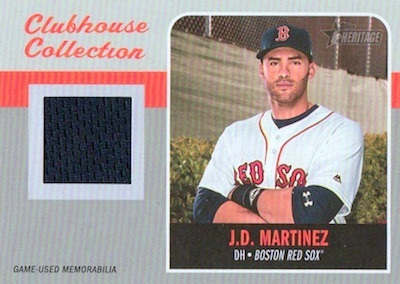 Just like the Real One autograph insert is a brand staple, so is the Clubhouse Collection Relic line. 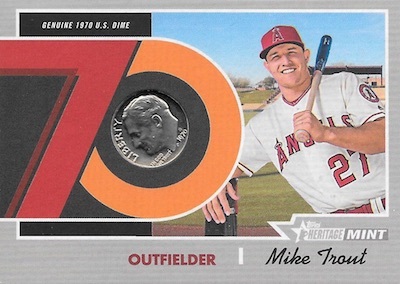 2019 Topps Heritage Baseball has Single, Dual (#/70), Triple (#/25) and Quad (#/10) relic editions. Only the single-player relic cards have a Gold (#/10) parallel, but all versions come in a Hobby-only Patch parallel (1/1). Joining these is the normal mix of Hobby-only 1970 Mint cards with U.S. coins from that year alongside past and present players. The options consist of Nickel (#/15), Dime (#/10), Quarter (#/5), and Half-Dollar (1/1). Similarly, the 1970 U.S. Postage Stamp Relics (#/50) set pairs a player and stamp from 1970. 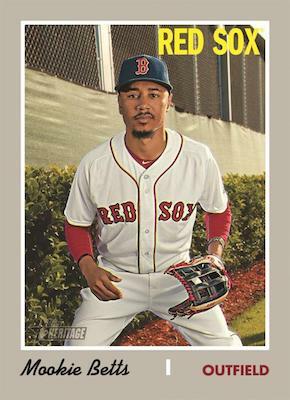 Reserved only for the Hobby format, 2019 Topps Heritage Baseball boasts a new assortment of Box Toppers that all use 1970 designs in some capacity. 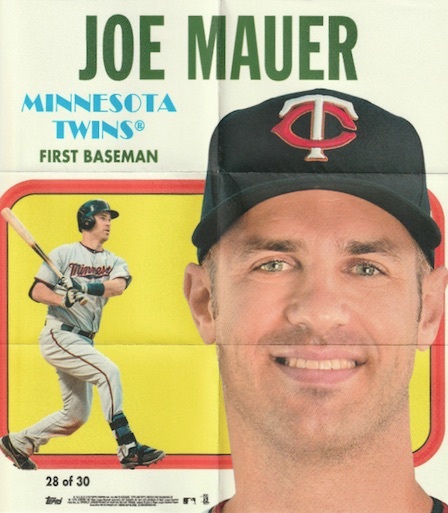 Collectors can find fresh takes on the oversized 1970 Topps Super Baseball cards, as well as 2019 Topps Teammates (70 copies) and 1970 Poster Box Loader (70 copies). 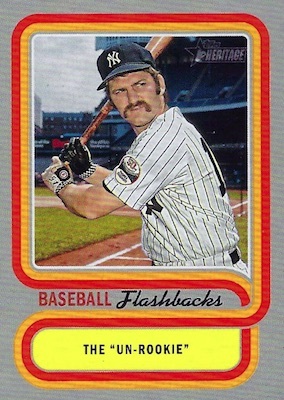 The 1970 Topps Originals cards are stamped buybacks from the original set. These all combine to fall one per Hobby box. 2019 Topps Heritage KYLE TUCKER AUTO RC REAL ONE BLUE INK AUTOGRAPH ROOKIE CARD! Buy 2019 Heritage MLB boxes direct from Topps. 500 cards, including 100 short prints. Key: LL=League Leaders; PH=Playoff Highlights; AS=Topps News All-Stars; WSH=World Series Highlights. PARALLEL CARDS: Black (Hobby - 50 copies), Flip Stock (Hobby - 5 copies). Work in progress. Full SSP guide and gallery. Let us know if you see any others. REFRACTOR PARALLELS: Purple Hot Box, Refractor #/570, Black #/70, Gold #/5 (Hobby), SuperFractor 1/1. 100 cards. Only in Walmart Mega Boxes. Buy from Walmart. See full details for the Mega Box format. CHROME VERSIONS: Base #/999, Refractor #/570, Black #/70, SuperFractor 1/1. 100 cards. Reportedly limited to 70 copies. 132 cards. Serial numbered #/100. 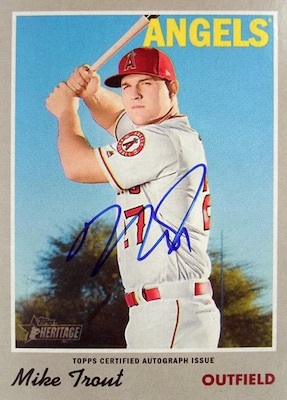 Buy 2019 Heritage MLB autographs on eBay. 53 cards, including two mystery redemptions. PARALLEL CARDS: Special Edition Red Ink - #/70 or less. 10 cards. Hand-numbered. Hobby only. 5 cards. Hand-numbered. Hobby only. 20 cards. Serial numbered 1/1. 14 cards. Hand-numbered #/25 or less. PARALLEL CARDS: Patch 1/1 (Hobby). 10 cards. Hand-numbered #/10 or less. Hobby only. 8 cards. Hand-numbered #/25 or less. CARD VERSIONS: Nickel #/15, Dime #/10, Quarter #/5, Half-Dollar 1/1. 20 cards. Serial numbered #/50. PARALLEL CARDS: Gold #/99, Patch 1/1 (Hobby). 25 cards. Only in Walmart Mega Boxes. Buy from Walmart. 15 cards. 250 copies. Retail only. 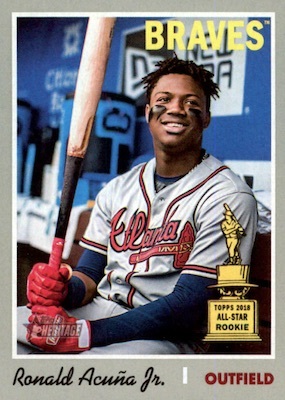 View the 2019 Topps Heritage Baseball checklist Excel spreadsheet. Nice — these Heritage appear to be a pretty popular set, agree? That is the name of the main autograph set in Heritage every single year. The borders are too large and the photo is too small. What’s the status on the Bazooka release? Will there be one? What about 3D XO Graph Technology debuted that year with the Kellogg’s set lest we forget the Milton Bradley print run? 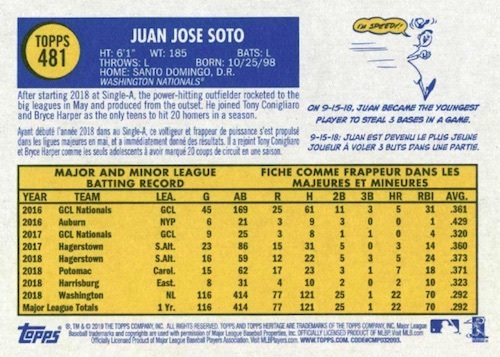 Maybe someone can influence Topps to acknowledge those sets as they would be fun to chase and collect them too. No status update on Bazooka. As soon as we have details, it will be posted. I started collecting full sets from 1964 on and I believe that the Topps 1970 set was the, hands down, ugliest early set ever made! I will be curious to see if they can spruce up a dull set. More Topps trash. So glad I stopped buying cards. Best decision I ever made. Tired of IOUs — oh, excuse me, REDEMPTIONS, my bad — redundant, pointless parallels and insert sets, poor typography, gimmicks, sticker autographs, a glut of garbage…need I say more other than goodbye? It’s hard to argue with David’s post (2/5/19) that the 1970 set was one of the ugliest Topps ever produced. However, this checklist is filled with drool-worthy content, and I am DELIGHTED the HHN’s are mostly populated with legitimate stars (thumbs up on Hoffy’s post from 1/23/19). I am especially delighted with the Munson Oversized CS, and the RODA/TA of the Braves. 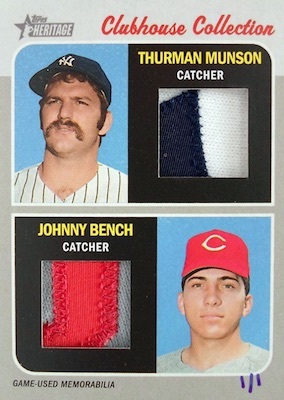 It appears, at least from the checklist and previews, that Topps is banging the ugly right out of the inaugural 1970 set. Look forward to having these in-hand next week! Interesting checklist – looking forward to seeing the actual cards. I noticed that the checklist doesn’t include team cards. I know that most people don’t care as there’s little $ value, but I like team cards and to include them would be truer to the original set. BTW, I always liked the 1970 design and the thick paper stock. Easy set for me to collect as only one card interests me, the annual Al Kaline autograph. Too bad Topps didn’t put either Rollie Fingers, Sal Bando or another Oakland A’s player with Reggie Jackson on the dual/triple auto cards. I just refuse to chase autographs of players who weren’t even born yet with the players that actually played in 1970! Short Printing all the stars is not the way to expand the hobby and make collecting fun, it makes collecting costly. Going to be a boring box to open, any card a person would want is an SP. And what’s with the huge borders? Cant believe Topps short printed the stars. 100 short prints with dealers charging a average of $10.00 a card. $1000, to complete the set. Not good. This is Topps #1 product as far as I’m concerned. 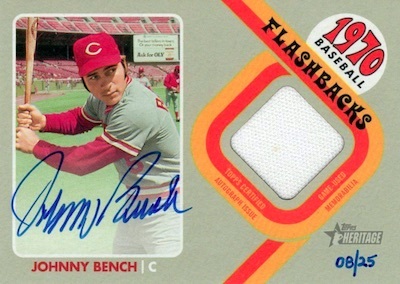 I will agree that the 1970 cards were really ugly cards but the Heritage cards mimic the originals and that I like. I even have certain 1970 originals ugly as they are. Love the product have always done heritage since they first came out. Collation is terrible. Opened my first box from a case and got only 1 SP. In one pack I got 3 of the same card. Not sure what the rest of this case is going to give me. Will let you know. Anyone else get shorted on SP’s? Update from my earlier post, the first box contained no SP, the one that I thought was a SP was a traded variation. Second box no SP’s only one Action Variation. 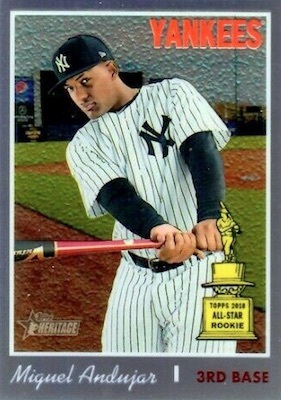 I had this issue a couple of years ago and it took Topps forever to make it right. Case I opened had 3 autos, none numbered, and 9 patches, 8 from the clubhouse collection and 1 dual. I respectfully disagree with complaints about the 1970 set. The gray borders and name typeface are distinctive, and most important are the terrific photos and wide variety of uniforms, washing away the dreadful impression of the 1st 4 or so series of 1969. It was crucial in 1970 that Topps reassert itself after the awful job it performed on the Athletics and Astros, in particular, in 1969. I love this design. Bought a case, and chomping at the bit to rip! Excellent product! Heritage is. always one of my most popular sellers. Love the throwback feel and look and the challenge of shortprints and variations. I had the same problem as John Linville. I opened 6 boxes and only received 5 SPs. All 5 were variations. In past years, SPs have been seeded one per 3 packs. We have been hearing many reports about issues with missing SP cards in Hobby boxes. I’d suggest you contact Topps to see if they can rectify the issue. The odds are still 1:3 packs, so likey an issue on Topps’ end. 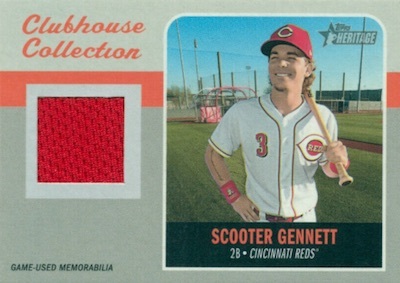 Maybe I am just burned out, but I just opened my first product of 2019 and it was a box of Hobby Heritage. I just found it bland and boring. 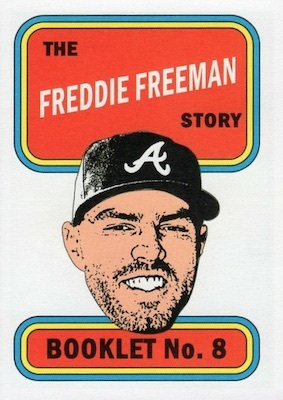 I was never a fan of 1970 Topps (I love 1971) so I should have known I may not be a fan. Yet it wasn’t just the blandness of the cards but the images seemed horribly photoshopped and stretched in some cases to fit the confines of the picture box. The inserts are hard to distinguish from a subset card and the bland relic vs a nice auto per box is getting old. Nothing about this box opening had me happy, even for the players and team I PC. Decent product. Wasn’t expecting much. Did get a hot box but that was the only thing worth mentioning. My Juan Soto box loader has on the back Bryce Harper listed as Bruce Harper. Would like to have some info on this. see if Topps will replace these cards. Love the old 1970 design! Hate the fact that all the star players are short prints. Topps way of making the big buck! I wanted to give this 2 stars, but can’t be sure that the blandness of this set isn’t mostly due to honoring the 1970’s design a little too well. The card stock is decent, but the design isn’t. 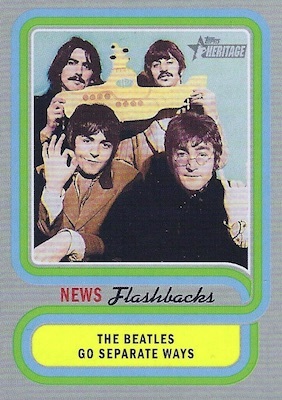 The new age performer cards are catchy, but they seem very out-of-place with the rest of the set. Star are hard to come by here too. It was a dull box to open with very few inserts and no numbered cards. Of course, most people will get a junk relic as their price for a hobby box. I’m looking forward to 71,72,73 & 75. Finished opening my case and out of 12 boxes only 1 of the 12 had any SP”s. Filled out the Topps form found on there website, so let’s see what happen’s. I busted a case – 9 relics (Harper, Salvador Perez, Porcello Yadier Molina & Gleyber Torres are the better ones) & 3 autos (Blake Snell, Bill Dillman & Rico Petrocelli). Best pulls were a Kluber flip stock /5 and an Andujar gold refractor /5. I picked up a couple blasters yesterday and pulled a Lourdes Gurriel Jr. red auto /70. 16 cards away from completing the master set. I’m giving 5 stars based on my experience. With the 1970 set being so bland (IMO), I had very little intention of collecting the this set. As an O’s fan I was browsing the checklists looking for any Baltimore signed cards and was VERY disappointed to see there are none so that sealed the deal for me. I will not spend a penny on the ’19 set. Hey Topps: Your “token Orioles” Brooks Robinson and Jim Palmer won’t cut it. A LOT of “meh” players from what I opened up, had VERY bad luck with any kind of inserts. I hit up Target and had two of their 19.99 boxes, and the few other forms they carry of it. Was very disappointed overall. Will not be buying any more, maybe just some singles on ebay. Bought 2 hobby boxes, no auto’s but 2 jersey cards (Freddie Freeman & Zack Greinke).. not much excitement. I think I’m done.. 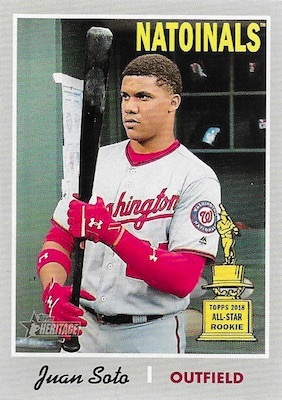 I hope Topps is not headed in the same direction of the competition with a “BASE” and a short pint set with all the stars and rookies. I’ve collected cards for sixty years and really hate to see this. It kind’ a takes the fun away from the hobby. Purchased a case for my son & I to open together. Really disappointed. After opening 12 boxes, we’re still missing ~80 of the base (1-400) cards. Did get a hot box where every pack had a chrome card, but didn’t make up for Topps’ awful randomization. Boring, unattractive design. Horrible cards came in the box of 24 packs I purchased. The photo edited is terrible with players photographed in front of bushes, fences and other non-baseball backgrounds. How could they mess up a retro set like this is beyond me, but its a bunch of really ugly designed cards. Opened 48 packs from Target. 5 short of base set and no dupes in the bunch. Crazy. Pretty bland roster of players in the base. Can only hope 1 or 2 of the rookies (I had never heard of) will hit big in the next year or two to drive up the value. Best bet to get decent chase cards is to buy on eBay. Any numbers on print run of clubhouse collection cards? Pulled Judge from hobby box, but don’t know how limited it is. cards. Total ripoff. I’m done with Topps Heritage, and may be done with Topps altogether. I buy Heritage every year and usually put together a set. This year’s Heritage is a bust. Not because I didn’t get a great autograph, but because the collation is horrible. I bought 3 boxes from one dealer and got 3 very, very similar boxes. I got 3 or 4 of many cards. This has never happened to me before. Combine this with Topps Jumbo boxes having less cards per pack, I think Topps is really making changes for the worse. I love collecting cards. 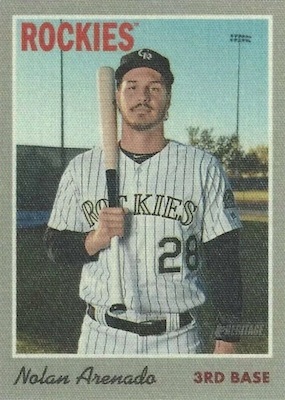 But so far this year, Topps stinks. I purchased a box from a local hobby dealer and I have to say, I’m very disappointed in this year’s Heritage. I essentially paid $100 for a box of commons, one unknown auto, and 2 short prints. Really bad job by Topps. Save your money because Topps dropped the ball on this. 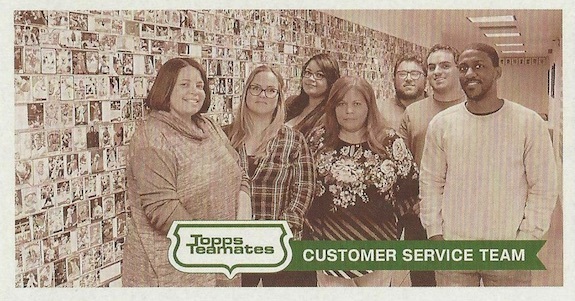 Oh, I forgot to mention the box topper was a card featuring the photo of 3 members of Topps Quality Control Team. Bought a blaster. Meh. 3 SP’s, nothing to write home about. No relics/autos/SSP’s. Got a dud box. Did notice a couple of errors that may have escaped QC (so not likely short printed). Look on the backs of 54 (Ross Stripling) and 97 (Rich Hill). Their stat lines state that they played for the Angels in the NL for a few years when in fact, they were Dodgers. Hill did play for the Angels briefly in 2014 (correctly identified) but not in 16, 17, 18. This 1970 heritage is a good looking set, like the grey border no funky colors on the back. Topps pretty much kept to the theme back then. Big disappointment, no team photos or check list included in set, if done right this could be a 3-series set with about 750 to 800 cards. Also too many short prints, Topps should cut that number in half. 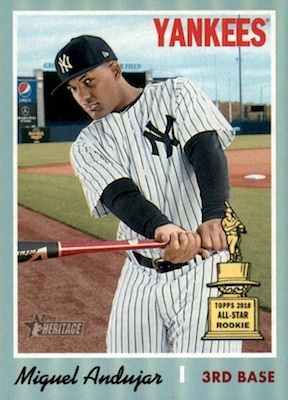 Topps has finally killed a once great product. A few years back would hit 2-3 Chromes per box now they are every other box. If Topps adds a stick of bubble gum into the packs next year it would be glorious. I would just swallow the gum and let it digest for 7 years in my stomach. Just started collecting again after 30 years and find these cards to be pretty cool and simple to understand with all the crazy variations in card collecting these days. We need more simple sets to attract the next generation. Less crazy variations of variations of chrome black refractor whatevertheheck short print. Just give me a simple set of cards to collect. Opened 2 Wal-Mart Mega boxes although they don’t carry the “Mega” designation this year. Great collation of the base. Just a few doubles out of the 30 total packs. Pulled one Chrome refractor (deGrom). Got the same 3 New Age (Ohtani, Betts, Lindor), 1 Then/Now (Yelich/Torre), and Flashback (Hendrix) in each box. In addition I pulled 2 cloth in each and 1 scratch off. Lastly, these boxes have a 3 card pack of Chrome that is listed as cards #100-200 in the set that appears to be simply a different hundred cards from the base in the chrome versions. From my 2 pack I pulled 3 #/999, 2 refractors #/570, and 1 black refractor #/70. Mega Box has 100 different chrome players – and different Game Used cards. At least the numbering on the GU is different. So are the poses. Any word on a checklist? Yep, it is noted under the other Chrome cards. These boxes just started showing up and no updated checklist was provided for them until today. How bout I hit the mystery player A special edition redemption in a blaster box from Target!! Great product with wonderful inserts, autos and super cool coin cards. Not to mention Chrome Refractors & Superfractors! 2019 TOPPS HERITAGE BASEBALL HOBBY BOX FREE SAME DAY PRIORITY SHIPPING !